Red Viburnum tree - a woody flowering plant that represents the collection Adoxophyes. The Latin name of the genus - Viburnum - according to one version is associated with the verb "viere", meaning "knit", "weave". Thus, the origin of the word is due to one of the direct uses of viburnum: from the young branches of the shrub knit basket. The first mention of the therapeutic use of viburnum and recipes of folk potions based on It are found in the herbalists of the 16th century. The bark of the plant was used as a sedative and anti-inflammatory agent for convulsions, hysterical seizures, sleep disorders, colds and suffocation. Decoction of the root was used for scrofula in children. Red viburnum - types and varieties. Fragrant viburnum – common in Japan, Korea, and India. The fruits of the plant contain vitamins A and C, tannins, pectins, important for effective cleansing of the intestine from accumulated harmful substances. Included in the phytoncides effectively destroy microbes. The fruit weight of phosphorus, magnesium, potassium, iron, manganese, copper, iodine. The leaves and berries contain acetic, valeric, oleic and formic acid. Rich vitamin and mineral composition is especially useful for the prevention and elimination of the decline of strength, vitamin deficiency. In the recipes of folk and official medicine used viburnum bark, flowers and fruits. Flowers and bark are used in infusions and decoctions, both for internal and external use. Fruits are most often used fresh, in a frayed state, with the addition of honey or sugar. Juice of fruit viburnum boil with the sugar, cook the syrup and jelly. Fresh viburnum juice is used externally for the treatment of skin diseases. Kalina is part of the vitamin teas. Viburnum berries covered with frost. The bark of viburnum ordinary contains bitter glycoside viburnin and the enzyme which causes its decomposition, cyclic alcohol liburnica, tannic and resinous substances, coumarin derivatives (scopoletin, esculetin), organic acids (valeric, formic, capric, linoleic, palmitic). The fruits of viburnum ordinary contain a cyclic alcohol of liburnica, invert sugar, bitter viburnin, ascorbic, acetic and izovalerianovoy acid, pectin. The flowers of viburnum found flavonoids compera-3 - glycoside and kaempferol-3,7 - diglucoside. The viburnum roots contain sterols, astragalin, paanoid, essential oil, derivatives of amerina. As part of the seeds of viburnum - up to 21% fatty oils. Herbal preparations of the bark of viburnum have hemostatic and weak diuretic properties, have astringent and calming effect, increase the tone of the muscles of the uterus, increase the duration of the sleeping pills. As a hemostatic agent, drugs based on the bark of viburnum are used for uterine bleeding (and bleeding of the climacteric period), with algomenorrhea, subinvolution of the uterus in the postpartum period, with bleeding on the background of inflammatory diseases of the female reproductive system, as well as hemorrhoidal bleeding. Use the bark of viburnum in the prevention of miscarriages. The fruits of viburnum (mashed with honey or sugar, in the form of syrup) are prescribed for nervous excitation, high blood pressure, atherosclerosis and vascular spasms. 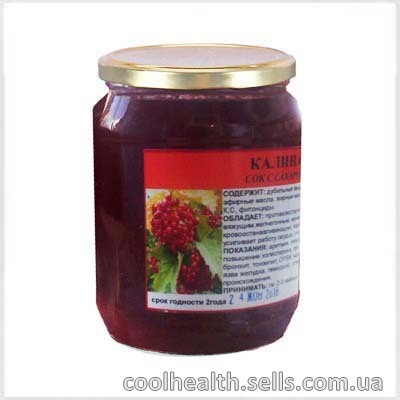 Viburnum juice with honey is used in folk medicine in the treatment of breast cancer, for the prevention of cancer of the stomach, with gastritis with low acidity. It is believed that the systematic use of viburnum fruit has a beneficial effect on the condition of patients suffering from malignant tumors of the digestive system. Infusion of the fruits of viburnum drink with boils, carbuncles, eczema, skin rashes of various etymologies, as a vitamin, tonic and light laxative. In dermatology and cosmetology fresh juice of viburnum helps with acne and age spots. Infusion of flowers is used in folk medicine for cough, cold, sclerosis, pulmonary tuberculosis and gastric diseases. Flower infusion rinse the throat and wash the wounds. In traditional medicine Viburnum and other medicinal plants the Extract of viburnum fruit on a water-alcohol basis can be found in pharmacies. It belongs to biologically active additives and is used together with food as a source of substances – proanthocyanidins. The juice of Red Viburnum with sugar composition. The juice of Red Viburnum with sugar properties. The juice of Red Viburnum with sugar application. edema of renal and cardiac origin. Dosage: take 2-3 teaspoons 3 times a day.